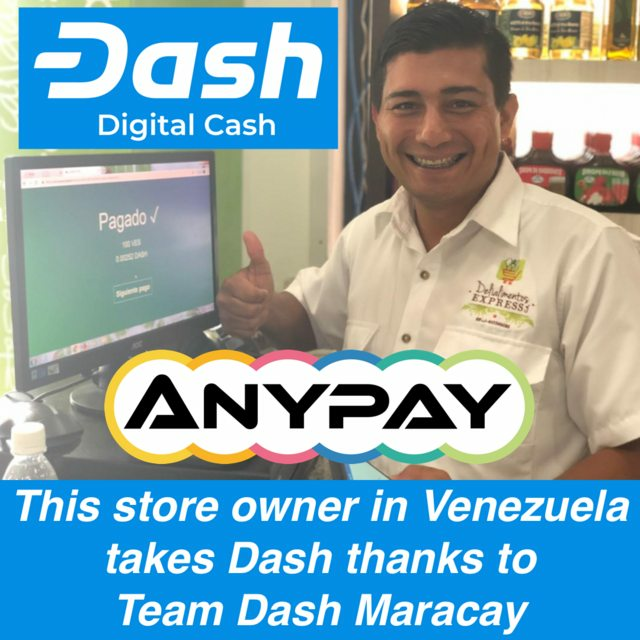 AnyPay collaborates with Dash marketing teams in Medellín, Maracay, Ghana and Bangkok to produce real-world data on regional Dash transactions, sign up new Dash merchants and professionalize Dash acceptance with AnyPay point of sale software. ﻿To be the #1 crypto cash register, making it painless and pleasant for merchants to accept Dash even when the business owner is outside of his establishment. To collect and publish the hard data needed to demonstrate that Dash is dominating in real-world cryptocurrency adoption. To create a global digital cash economy with Dash at its center. New Real Merchants : AnyPay is working with city-level Dash marketing projects to accelerate Dash merchant adoption in the developing world, where Dash mass adoption is happening first. Better Dash Acceptance : AnyPay’s point-of-sale (POS) software enables merchants to accept Dash payments fluidly and securely even when the owner is not present in the establishment, which is key to professionalizing regular merchant acceptance of Dash. 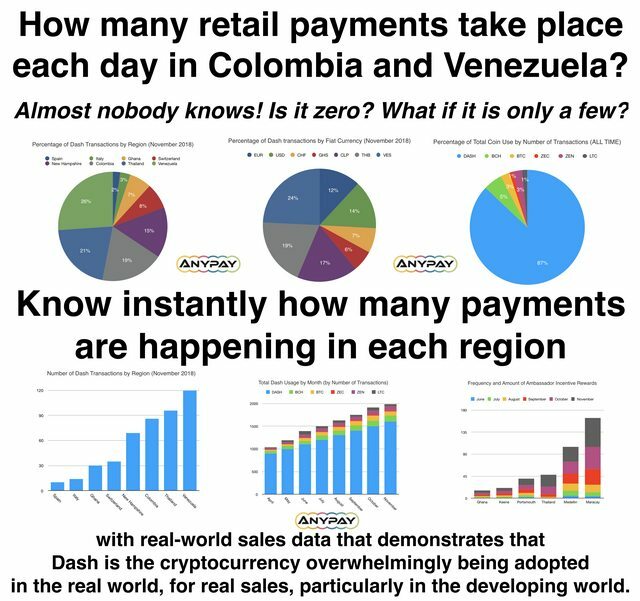 Clarity of Data about Real Payments: How many retail payments take place each day in Venezuela and Colombia? Almost nobody knows! Is it zero? What if it is only a few? Is our investment way out of proportion? With AnyPay real-time reporting, know instantly how many payments are happening in each region. With AnyPay, Dash marketing teams can produce real-world sales data that demonstrates that Dash is the cryptocurrency overwhelmingly being adopted in the real world, for real sales, particularly in the developing world. ﻿Dash-Back Program (30 Dash): Instant bonuses to merchants and customers to incentivize more Dash spending. AnyPay on the App Stores (40 Dash): iOS and Android AnyPay app in the app stores FREE to download. New AnyPay Languages (3 Dash): Russian, Slovenian, Malaysian, Creole, Thai, Italian, German. AnyPay will provide these deliverables to the DAO for an ask of 40 dash per month for 3 months (40x3). Working point of sale software for Dash, free to use and available in 6 languages and for 168 fiat currencies, with 0% commission and no monthly fees. The Dash-AnyPay Ambassador program, which is how we got about a dozen retailers in Bangkok to accept Dash as well as the first car dealership in the world to officially accept Dash, as reported in Forbes﻿. The Dash-Back program, where we have incentivized 4044 transactions at 66 merchants for a total of 104.9 dash spent over 6 months, which increased Dash use both overall and as a percentage of all cryptocurrency payments in a few short months and continued impacting the purchasing behavior of customers despite a one-month interruption in funding for Dash-Back. Won’t other coins also benefit from this work? Ambassadors use AnyPay’s ability to accept multiple coins as a way to get Dash’s foot in the door. Dash will benefit first and to a far greater extent because we are working directly with Dash marketing teams, and the new data AnyPay produces will enable us to leverage this opportunity to conclusively demonstrate Dash’s superiority in real-world use and adoption. Where is AnyPay based? In New Hampshire, home to the strongest Dash adoption movement in the US. Who is behind AnyPay? Derrick J Freeman and Steven Zeiler. Steven is a professional software developer dedicated to making powerful tools that empower everyone on the planet to use cryptocurrency. Together they have activated more merchants to accept Dash than anyone else in America. How is AnyPay’s uptime? After upgrading servers and investing in measuring and improving our code’s reliability, we are now at 99.9% uptime in October. “1. This is not and should not be a Dash exclusive Point of Sale system. 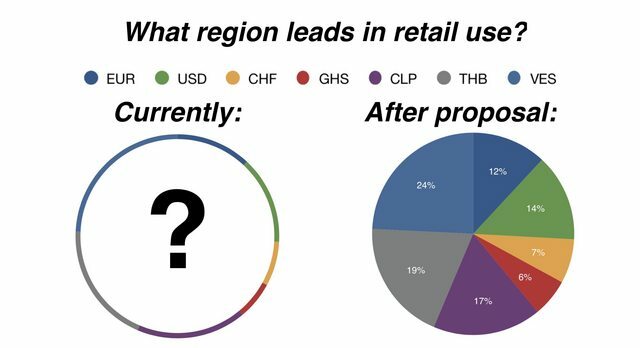 Merchants are far far more likely to want it and use it if they can also accept Bitcoin, etc. Bitcoin, or Bitcoin Cash are not my enemy. Fiat is my enemy. There is gobs and plenty of room in the space for many winners. HOWEVER, Dash is the only one that has a substantial Dash-Back feature that rewards people for using Dash. AnyPay is very much pro-Dash. Making it exclusive to Dash would not be better for Dash.Do not be mislead by the sunk cost fallacy of "paying for other crypto currencies". It will have a good Return on Investment and it will enable real world use of Dash. That is the only metric that matters. 1. Not Dash exclusive - we are paying for them to support BTC, LTC and whatever else they want. 2. No financials - nope, apparently a POS company doesn't need to do basic accounting for their business. 3. No new verified new members of Anypay. 4. A total of under 560 transactions per month on their platform, of which only 391 are actually Dash. 5. A total of less than 34 Dash in total transacted, which is basically nothing! Continuing to vote NO WAY to junk like this, continuing to help others see where there is no value in proposals, no matter what. Thank you for your continued support, qwizzie. Where can I learn about setting up as an ambassador where I live? I have no problem that Dash isn't exclusive on your platform. I prefer that in fact. Give people options and they still pick Dash. That is valuable info. I'm glad your reporting will shine a light on that! Thank you for taking an interest in our proposal and offering your feedback about preferring a multi-coin POS vs a Dash-exclusive one. We have witnessed that given the option, people choose Dash. Passing this proposal will help prove that with hard data. The more businesses use ANYPAY, the more data the Dash community will gain about how people are using Dash for real-life commerce. I sent you a message in Dash Nation so we can talk about spreading Dash acceptance at businesses where you live. In case you intend to request for larger amounts in future, you guys need to rework the deal you are offering us. Dash should not be footing the development bill alone, while Anypay keeps supporting larger competitor currencies. The other four currencies should have to pay a 1% fee (or 0.50% at the very least) on merchants accepting them through Anypay, while Dash should have only network fees, as long as you guys are intending to request larger funding in future. We should make this clear, until Anypay finally hears the message. How can you get this many up-votes, this is not the first time it is mentioned, and it does seem they changed there ways, they have not listened one bit, and you want to give them the money anyways ? You can not be seriously wanting to give them money out of pity ! Hello Johndude we appreciate your feedback. We understand that it would be unreasonable to expect Dash to pay for the development of software that benefits other coins at no cost. The truth is Anypay has now received capital to grow from customers on behalf of DASH, ZEN, ZCASH, BCH, and XRP, with many more in our pipeline. Fortunately the features and capabilities developed to satisfy the requirements of our other customers often benefit Dash directly. Dash is not subsidizing a free rider other coins except perhaps Litecoin, but nobody really uses Litecoin anyway (less than 1%). We can add a fee for LTC but it seems rather unnecessary to me since DASH has nearly 100x more volume than Litecoin on Anypay. 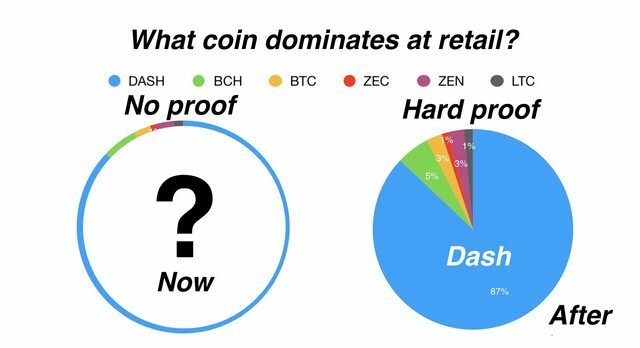 At the same time in our experience Dash benefits being on a platform along with Litecoin because more often than not merchants have heard of Litecoin but not Dash, though of course in time they discover that Dash has the most actual users. After watching the Dash 3 amigo's podcast featuring Anypay. It became very clear to me that Anypay does not have allegiance with any crypto currency. Especially hearing that Ripple is one of the good guys, made my jaw drop. I also find it disturbing that in this proposal you keep using the word Dash at every stage even do you're clearly also promoting other crypto's even do they have not paid a dime. With that in mind, I want very strict agreements. - I want a clear distition when it comes to Dash it's instant send vs all currency's that do not offer the same level of protection against double spend. Most of all I don't want dash to pay for abuse of double-spends and suffer a image damage. Double spend must be something that is included in every pitch of installing a POS in any business especially the brick and mortar. - Anypay needs to be more focussed on how to promote Dash instead of how to promote crypto, at least when it comes to anything funded by Dash. Bitcoin at your business, the easy way. Dash and Bitcoin at your business, the easy way. A_node_to_a_Master, you are right. We should and will promote DASH more often, specifically right on our homepage. You will be happy to see our title has been immediately updated to reflect your suggestion. We are happy that Instant Send now works correctly on Anypay. It was inconsistent when we first launched due to faulty support by a service provider (no excuses here -- we should have been more diligent). Now we can extoll the advantages of Instant Send more thoroughly. Regarding Dash funding other coins: the truth is Anypay has now received capital to grow from customers on behalf of DASH, ZEN, ZCASH, BCH, and XRP. Dash is not subsidizing support of other coins except perhaps Litecoin, but nobody really uses Litecoin anyway (less than 1%). Thank you for your valuable feedback on our proposal. We hope to continue working together to produce the best tools possible to help those on the ground spread Dash retail adoption globally. I like the work you are doing with your product but I have some concerns and suggestions regarding Dash. I'm seeing that many dash marketing teams are promoting Anypay software for free. Technically anypay is using the marketing infrastructure of Dash to expand and as the @A_node_to_a_Master companion said, anypay supports several cryptocurrencies that are Dash competition. To finance this proposal: what actions does Anypay undertake to prioritize the use of all possible forms of Dash, since in addition to requesting financial resources, marketing infrastructure resources are being used. For example: Has someone related to bitcoin helped finance the project? Since I see in the FAQ that you include it as FIAT currency to Bitcoin. On the other hand you have indicated that from ZEN, ZCASH, BCH and XRP you have received financial support. That is inconvenient if it is verifiable? Within the conditions of the proposal (verbal contract). powered / parnershiped by Dash or something similar in a very visible way? blockchaintech we commit to maintaining permanently a version of our site dedicated completely to DASH, one which the DASH marketing teams we work with can proudly distribute without fear or inadvertently promoting other coins. The site will be located at https://dash.anypay.global and will feature most prominently DASH branding and teach users about the DASH advantages, best practices, dash-specific setup, etc. We love DASH and aim to further dedicate the DASH we receive as part of our regular proposals to DASH-specific branding and product focus. We completely understand and support the mission of our DASH team to brand ourselves as the best coin. In the future we plan to offer specifically DASH-optimized integrations with Dash Core wallet, for instance, to allow our DASH teams around the world activate new merchants most easily. Im not so sure there is an economic benefit to dash as it is already available on your platform and users will use it. Using the dao to further ones own business agenda by offering 'air drops' is not currently or will ever be the daos priority. First and foremost, you guys impress me. Love the notion of getting sales data from about the planet. Q1. Could the 'Ambassador Program Dashboard (20 Dash)' and 'Dash-Back Program (30 Dash)' be abused? Example scenario: Bogus sales repeated at a retailer between the business owner and family members for example, just to collect Dash bonuses. Q2. Could you please shed a little more light on how the incentives work? Criticalinput, thank you for your kind words and thoughtful questions. tl;dr: Can the programs be abused? Yes. They already have been. It will take some trial and error and lots of feedback to get them right. Fortunately, we have already tested and improved the programs on a small scale and with the help of our merchant network and the Dash community, we dramatically minimized abuse. The more locally administered the program, the less likely the programs can be abused. We first attempted these programs on a small scale using our own money and limiting the scope to New Hampshire. The result: a $200 Dash reward for each new merchant plus Dash-Back at all businesses inspired a handful of individuals to set up new businesses to accept Dash and drove transaction volume up significantly. The large majority of new businesses were legitimate. A few people claimed fake businesses to get a reward. When Dash-Back was a flat $5 per transaction, some people rang up multiple items separately to claim multiple Dash-Backs and profit from the system. Fortunately it was only on a small scale. Our merchants immediately informed us what was happening. Using feedback from the Dash community, we tweaked the Dash-Back rewards to be 10% back up to $5, and the abuse stopped. We changed the requirement for the ambassador reward: now only brick-and-mortar retail stores with photographic proof of a purchase are eligible for a reward. The abuse there stopped too. As the programs expand, we would like to see the Dash merchant ambassador teams control funds and administer rewards as they see fit. The more decentralized the better. After all, they are the trusted ones on the ground speaking with the merchants. They should be able to administer their own ambassador program, set their own rewards structure, and automatically track merchant transaction data. Anypay's role is making software to make it easy for them to grow merchant adoption and prove their effectiveness with automatic reports and hard numbers. We do not know the best incentive structure for growing merchant adoption. Perhaps through different teams experimenting with different incentives, one strategy will emerge that is more effective than the rest. Perhaps different strategies will work better for different locations. Who knows? One improvement to the ambassador program could be this: instead of paying a one-time bounty for setting up a business, a reward could be tied to transaction volume. For example, what if instead of getting $200 in Dash for setting up a new business, an ambassador received 10% of the value of all Dash transactions from a business up to $200? That way, they are incentivized not only to set up the business but to drive new Dash customers there. They benefit when the business benefits from new customers, and the greater Dash community benefits from greater real-world adoption. Right now the ambassador program is administered fully manually. This proposal will allow us to begin to automate and decentralize the Ambassador Program and the Dash-Back program. There is no way 3 months and 120 Dash is enough to implement a fully automated system worldwide, but it will allow us to demonstrate a taste of what is possible. We humbly yet enthusiastically ask for your support. "an ambassador received 10% of the value of all Dash transactions from a business up to $200?" - This may be a legit idea. I know the issue is tricky. Thanks for the detailed reply. "To collect and publish the hard data needed to demonstrate that Dash is dominating in real-world cryptocurrency adoption"
You have me sold on this one. We need hard numbers coming in. RobbyDash01, thank you for your support. Imagine the peace of mind and confidence our community can have once it is demonstrated with hard data that Dash is number one in real-world use. 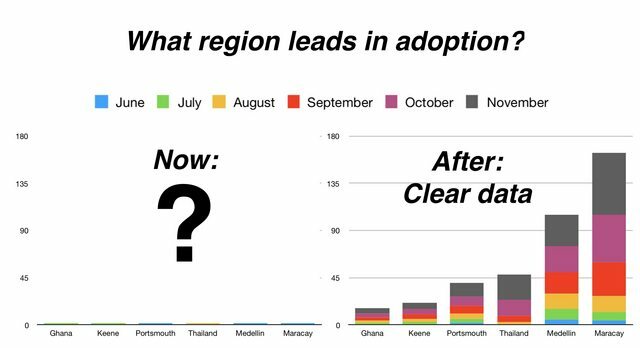 Adoption teams in different regions can use that data to measure the effectiveness of their outreach relative to others and adapt their strategies to increase adoption rates overall.